Searching for a list of Flags of All Muslim Countries with Names and see their exact pictures with accurate design then here's the list of Flags of All Muslim Countries with Names and we are sure that its a 100% correct list so that you can see all Muslim country flags at one place. Now you can see Flags of All Muslim Countries with Names and their capital city name with the details of population of Muslims in each country. So download or read below a list which includes Flags of All Muslim Countries with Names and more details. 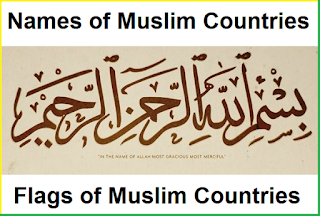 This is the most accurate list for Flags of All Muslim Countries with Names and more details, but if you think that data has been updated for a country and not updated here then please let us know and we will update this article about Flags of All Muslim Countries with Names with more updated data. In other hands if you liked our work and want to spread a word about it then do share this article with your friends and family members and also with your fellow students so they can get help in gaining data about Flags of All Muslim Countries with Names and other information.